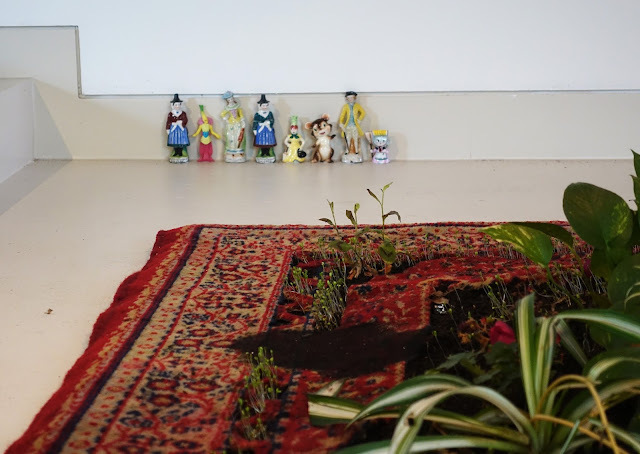 Common Fate is an open residency of project work culminating in a series of installations and performances. It is a changing reflection on our personal collections of death and memory objects. It explores the multiple narratives of our inherited possessions and intimacies. 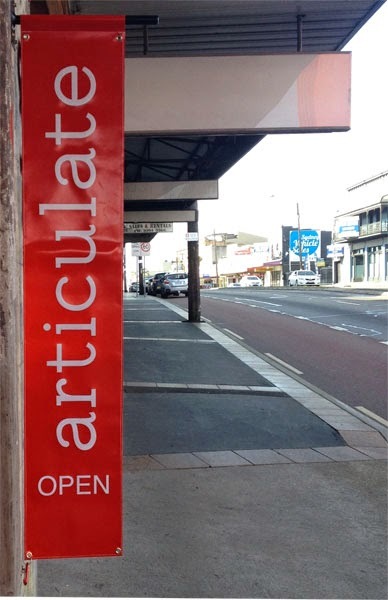 Articulate will be open 11am-5pm, Thursday to Sunday until Saturday May 5th during which time there will be opportunities for discussion and interaction with the artists in the evolution of the project. The heartwarming story of a community coming together to challenge mainstream attitudes to dying, death and the business of funerals. 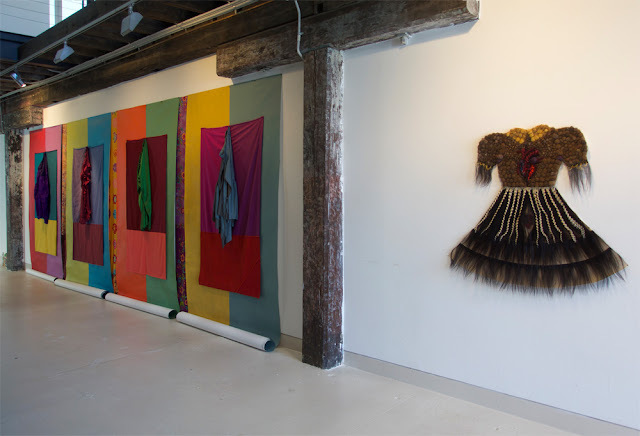 2pm Artist’s Talk: Invited artist Sylvia Griffin presents her contemporary practice of working with memory and trauma. Due to the sensitive nature of discussing death and loss, we ask that there be no recordings of performances or talking circles out of respect for the participants and observers. Please arrive 10 minutes prior to performances thank you. After someone dies there are objects left. We call them possessions, and understand them not just in the sense of literal ownership, but in the complex way an object reflects a person back to themselves. 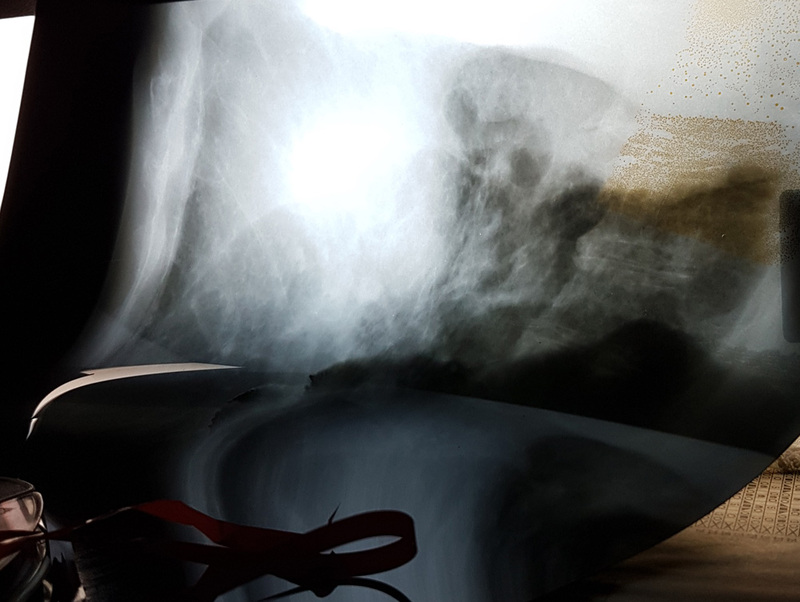 However fleeting or lasting, the intimate connection to an object is something we all have, and when death severs that relationship between person and possession, what becomes of it? 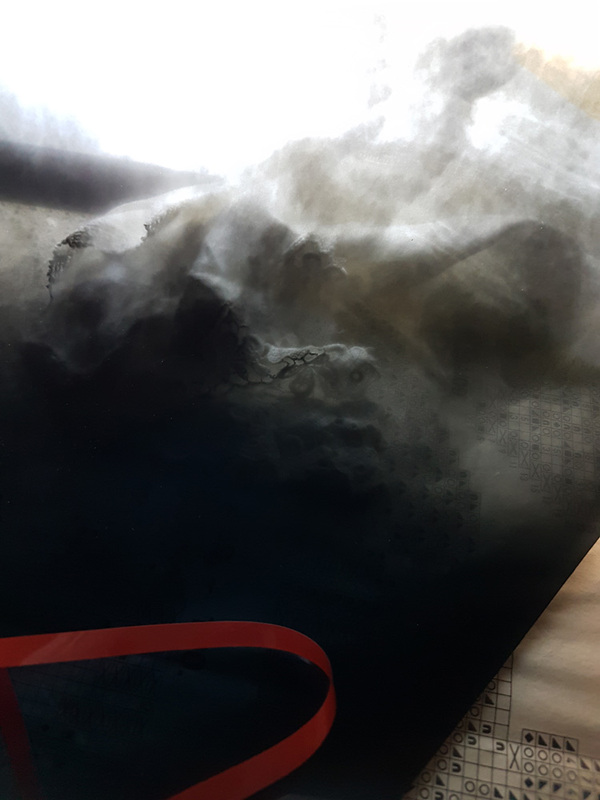 This liminal space of loss is where the project Common Fate resides, as an exploration of collections of objects left behind after death and an extrapolation of their resonance as possessed or known objects or lost intimacies. After death some possessions are highly visible, all over a person's house: next to their bed, in their bathroom cabinet, in the kitchen or in the drawers of their desks. However a great numbers of possessions are hidden, sometimes never seen by loved ones until after death. Who possesses these visible and hidden objects now? When we see the material things in someone's possessions as a collection of intangible and intimate connections between them and the actual object, we can also see narratives around the transferral, dispersal or disposal of these possessions as layered and intricate relationships, family history and cultural inheritance. 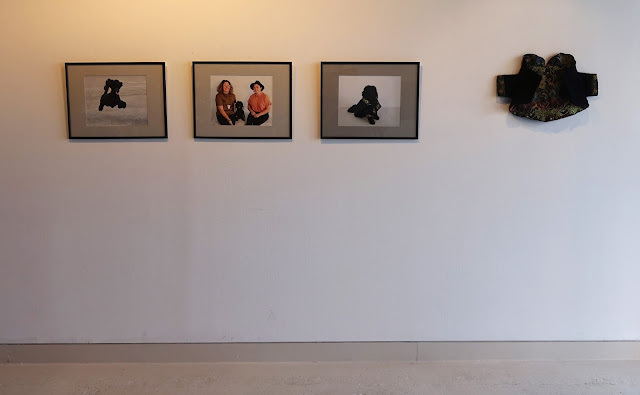 Common Fate aims to reach out to the community; to initiate conversations, to provoke memories and stories, opening up expressions around diverse cultural concepts of death in order to bring to the fore what closure really signifies. Sonja Karl and Liz O'Reilly will be artists in residence in Articulate project space from 20 April 2018, using their personal collections of 'death objects' as the basis for Common Fate, from experimentation to installation, incorporating a dialogue with the community, finishing with a closing on the third weekend. shows the work of Linden Braye, Rachel Buckeridge, Lesley Giovanelli, Anne Graham, Pam Kleemann and Eva Simmons. I love this song, Karen’s amazing voice and the apt words of the song and I love old towels. so why not combine the two. and add a crystal.An ode to Karen and Katie in towels and bottles. I usually work with either found or second hand things, making art, clothes, bags, anything really. Archie was a star on the Chinese New Year banners in Sydney 2018 wearing a Chinese jacket . This jacket was made at the Australian Tapestry Workshop, Melbourne, and it is made from Archie's own fur, felted to make a jacket to keep him smart and warm this winter. 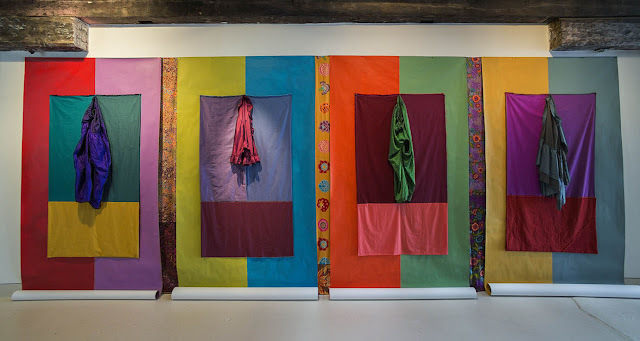 African-American artist Adrienne Wheeler invited a number of women to contribute to White Dress Narratives (part of the Pure Power exhibition). Each artist was given a white dress blank canvas, to decorate according to our individual perspectives/interpretations of the white dress. The original white dress was hand-made for her mother's year 8 graduation, and the template was cut from the original dress. Walking past a Madonna on Wei Bao Shan Mountain 2018 clothing Indian and Chinese cottons, Malaysian printed sarongs, American designer fabric. This colour field began with clothing belonging to myself and friends. We no longer wear them but they represented an era in our lives. I wanted to capture the richness of the material and colour and perhaps some of the fantasy they held for us. The brightness of the colour and the patterned fabric reminded me of a beautiful temple I visited in China. 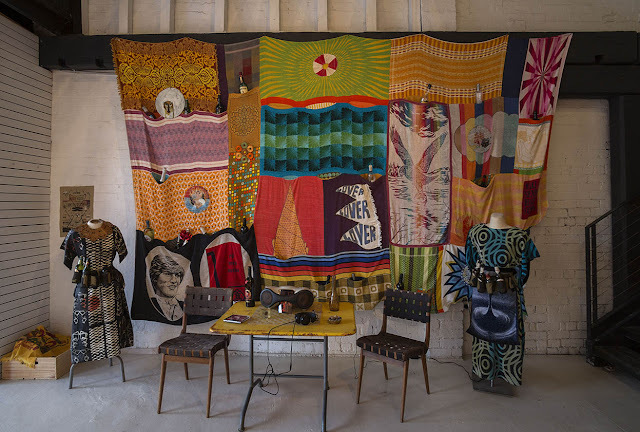 Culture Vultures represents the historical and cultural layers of objects. 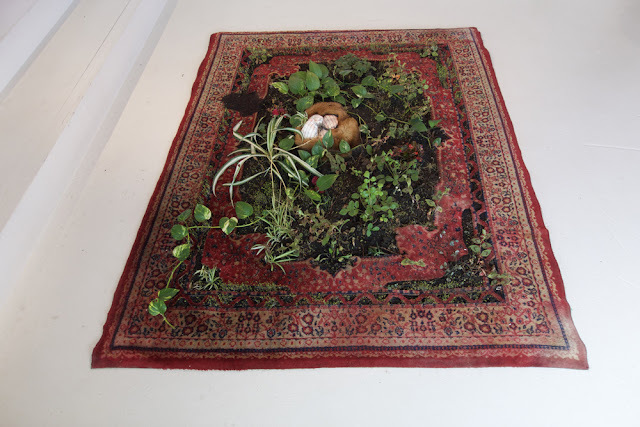 Nature Morte 2018 carpet, plants, earth, fox fur. This carpet was given to me by a good friend because I always admired it. Two events in my house led to its demise. It has been re-used and regenerated. This work re-uses the pockets of discarded fur coats. 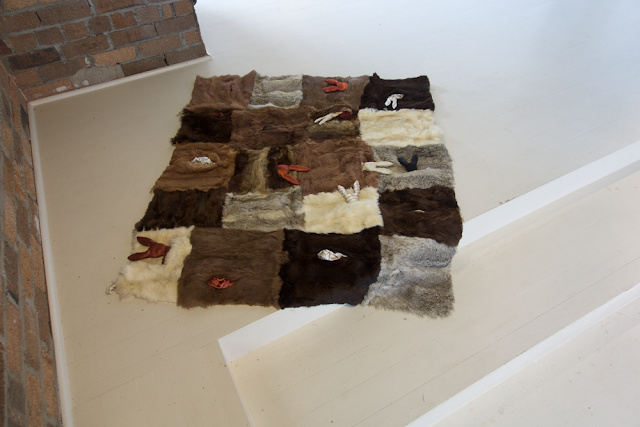 The rabbits are made from silk lining which when in the coats give extra luxury and value. 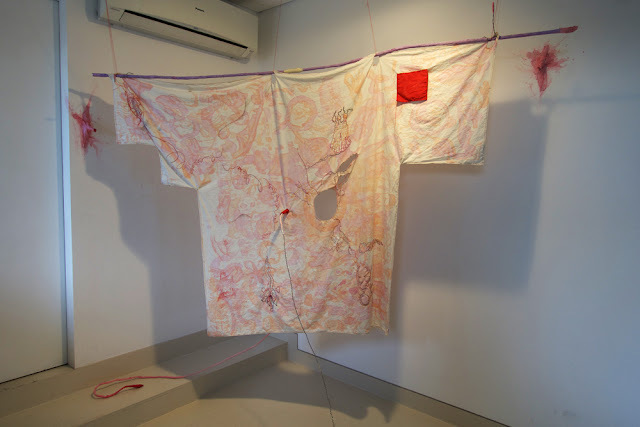 Eva Simmons Anorgasmia 2018 Aluminium wire/foil, textiles acrylic paint, ball-point pen, kitchen paper, oak dowel, ova glue.